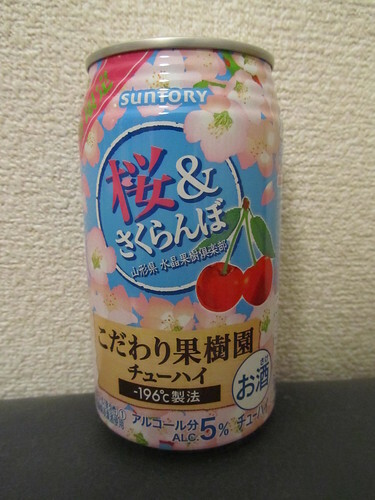 Chu-hai (also written “chuuhai” or chūhai) is an alcoholic drink which is popular in Japan. It is most commonly seen sold in cans, and is readily available from convenient stores and even hotel vending machines. You can also purchase it in bars. The name “chu-hai” comes from a drink called “shochu highball”. Shochu (焼酎 / しょうちゅう) is a Japanese liquor which is quite similar to vodka. A “highball“, for anyone who doesn’t know (and I didn’t! ), is the name for a certain kind of mixed alcoholic drink composed of an alcoholic base spirit and a larger proportion of a non-alcoholic mixer. There is a tendency in Japanese to take two words and shorten them into one more catchyword, and that is what has happened to make “chu-hi”. According to this Japan Times article (2008), chu-hi has been around since shortly after World War II. At that time, alcohol was in short supply and whiskey was a luxury item, so people drank shochu (which can be made easily from sweet potatoes). The article says, “In the last five or so years, shochu has gotten trendy and is often of high quality. But in the chaotic postwar period it was usually foul-tasting hooch of dubious origin. To make it go down easier, the street stalls and saloons that served it started mixing it with soda water and calling it a “shochu highball,” or chuhai, for short. The concoction spread quickly, with variations made by adding fruit juice, flavored syrup or tea.” So there you have it – the birth of chu-hi! The standard original flavour of chu-hai was shochu mixed with carbonated water and lemon. However, lots of different variants are available now, and new seasonal flavours/can designs are produced all the time. In fact, some brands of chu-hi don’t even use shochu anymore, but use vodka instead. 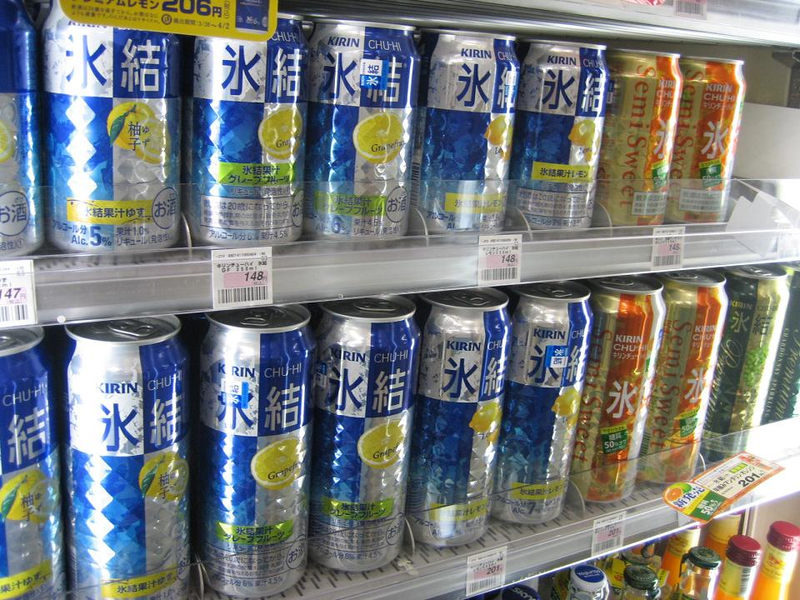 Kirin, Suntory and Asahi produce a lot of the popular canned varieties of chu-hai which are sold in the shops. And this orange flavoured one, which just tasted like Fanta! If you visit Japan, even if you don’t drink alcohol, I would say you are bound to come across chu-hi. When you’re looking at the soft drinks in the chilled cabinets in a convenience store, pay attention to the details and try to read the cans. 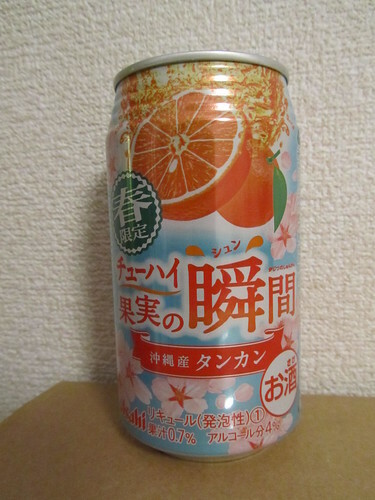 When I first went to Japan I wasn’t even sure which drinks were alcoholic and which were soft drinks, as a can of chu-hi can look like a can of fizzy drink. Confusingly though, the word “cider” in Japan is used for soft drinks, not alcoholic drinks, and companies like Asahi make both soft drinks and alcoholic drinks. Yes, a chu-hai hangover is not pretty! For next week’s イ, how about 苛め (bullying), いれずみ (tattoos), 居酒屋 (izakaya), いまり (imari porcelain)? I’d love to know what you could have written about faeces!